Have you ever eaten so much junk you feel like you need to eat vegetables all day to clean out your insides? Maybe that’s just me. I ate an awful lot of sugar cookies this weekend, on top of a delicious but probably not so healthy meal at the Dominian Square Tavern (loved the corn fritters and homemade ketchup), so I felt like I needed a healthy veggie based meal. Enter this Carrot and Lentil Salad. I based it very loosely on a recipe from Food and Wine. When I say based I mean I remembered seeing a salad with carrots, tomatoes and chickpeas. I didn’t have any chickpeas on hand, so I substituted lentils. 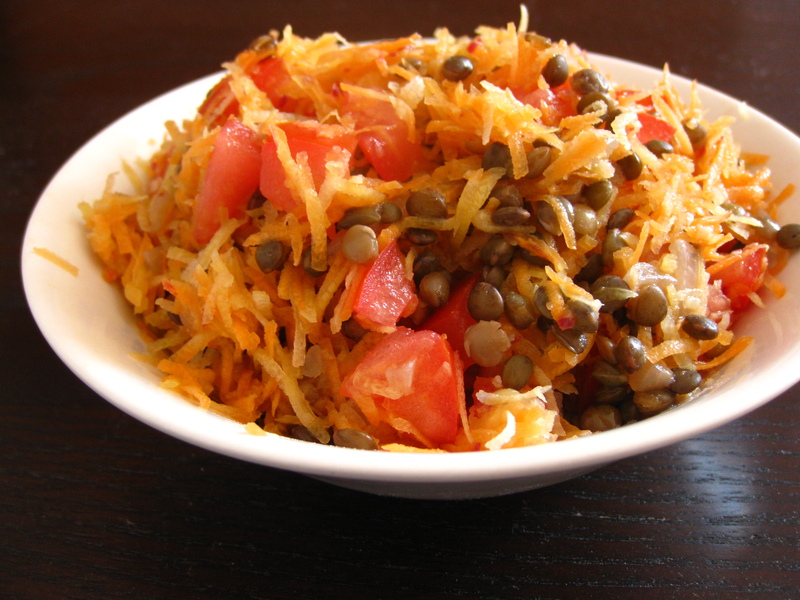 Cook the lentils: In a medium sized pot, sautee the onion until translucent. Add the lentils then cover with two cups of water. Add oregano, bay leaf and salt and pepper to taste. Bring to a boil then simmer until the lentils are cooked. Drain any excess liquid. Toss the lentils with the carrots and tomatoes. Dress with olive oil and lemon juice. Season with salt and pepper. I always have the feeling i ate too much junk food and need to scrub my insides! It’s like a seesaw for me :) But somehow, it seems to work out. That sounds amazing! I feel like that after we’ve had guests and after the holidays…time for cleansing veggies! I have definitely had that feeling before! This looks like the perfect antedote. Yes! We go through that too often. This dish looks for healing. Yum! PS, I’ve got a giveaway going on that I think you might be interested in :) Stop by and check it out! That looks like a great salad to resolve having eaten poorly for a while! I love carrots and I love lentils! What a beauiful salad! Looks light and refreshing! THis looks sooo wonderful and healthy! Yum, I love finding new great lentil recipes!